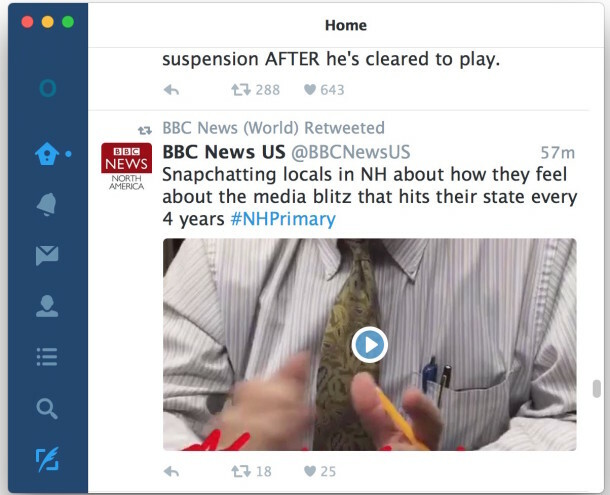 The newest versions of Twitter for Mac and iOS default to automatically playing videos and gifs that are found within a feed. This can lead to the Twitter app becoming a stream of continuous noise and nuisance, or worse, as any video (uncensored or not) starts playing itself without user input. Whether you think this is good or bad likely depends on what is being shared by what and who you follow on Twitter, but sometimes even the most work-oriented and focused Twitter accounts can wind up seeing awful NSFW and NSFL autoplay content thanks to the auto-play feature. Additionally, it can waste bandwidth and be a major distraction, so perhaps autoplay video is best turned off. Now you should be able to browse through your Twitter feed without being blasted with random automatically playing videos, movies, gifs, as they will no longer play themselves unsolicited. Instead, if you want to play a video in Twitter, you’ll click on the play button on a video or gif you want to play, giving the control to the user rather than the app. This is particularly worthwhile for users who have livestream enabled in the Twitter for Mac app, which otherwise can produce a constant stream of videos and gifs eating bandwidth and resources, and as we already mentioned, can easily lead to you seeing stuff you’d really rather not ever see. If you don’t like this feature on Mac OS X Twitter you’ll probably want to turn off the same video auto-playing feature on Twitter for iPhone as well. Of course Twitter isn’t the only online service who has autoplaying video, most do these days, and perhaps you’ll want to disable autoplay video on Instagram as well as turning off video autoplay on Facebook for iOS too. And if you decide later that you love autoplay video and miss the feature, it’s always a quick settings change away to get your gifs and movie clips playing themselves again. No harm no foul! Great tip. I’ll add another one for Twitter power users. If you use Twitter as a data stream primarily (like I do) for headlines, turn off the image preview feature as well. It’s in the same General settings. It makes the app much faster, it fits more tweets on screen, and 90% of the time an image attached to a tweet is just fluff or filler that isn’t worthwhile anyway. And, the reason autoplay is enabled in the first place is so they can show you video ads. Video ads = $$$. Same with Facebook and Instagram, which is also Facebook by the way. Autoplay video means autoplay ads. Twitter would be a good fit under Google, Apple, or even Microsoft, but as a standalone company they are messing with the service an awful lot due to shareholder pressure. Clearly the downside to being public. 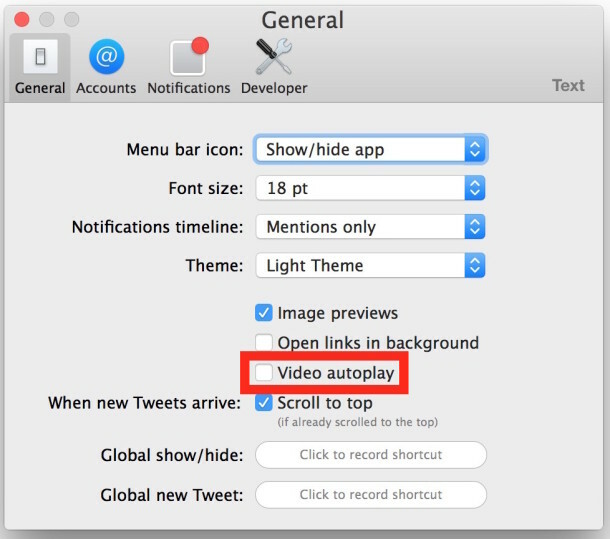 OK sounds good for Twitter, but can anyone tell me how to turn off autoplay video in Safari? Yeah. So far the only way I know of is extension-based, with non-trivial loss of functionality. There is simply no way to say to Safari on OS X, “Do as you would do on iOS”, i.e., do not preload or autoplay videos. Too bad that we can’t also turn off video autoplay in Safari.